Police on Friday confirmed that the remains — found roughly 12 miles from the University of Virginia campus — belong to Hannah Graham, who went missing in September. Authorities on Friday announced that the remains found on an abandoned property on Oct. 18 are indeed those of missing University of Virginia student Hannah Graham. The remains were discovered in a rural area of Albemarle County about 12 miles from the University of Virginia campus. The UVA sophomore disappeared on Sept. 13 after a night out with friends. A man who was recorded on surveillance tape walking with Graham on the night she went missing, 32-year-old Jesse Matthew, was arrested on suspicion of her kidnapping. Matthew has also been linked to the disappearance and death of Virginia Tech student Morgan Harrington, whose remains were discovered less than six miles from Graham's. Authorities search a rural area where human remains were discovered in Albemarle County, Virginia, Sunday, Oct. 19, 2014. Graham's parents released a statement following the confirmation, thanking law enforcement officers for finally finding their daughter: "Hannah is coming home to us and we will be eternally grateful." Statement from #HannahGraham&#x27;s parents after remains found in AlbCo are positively ID&#x27;ed as the missing UVA student. 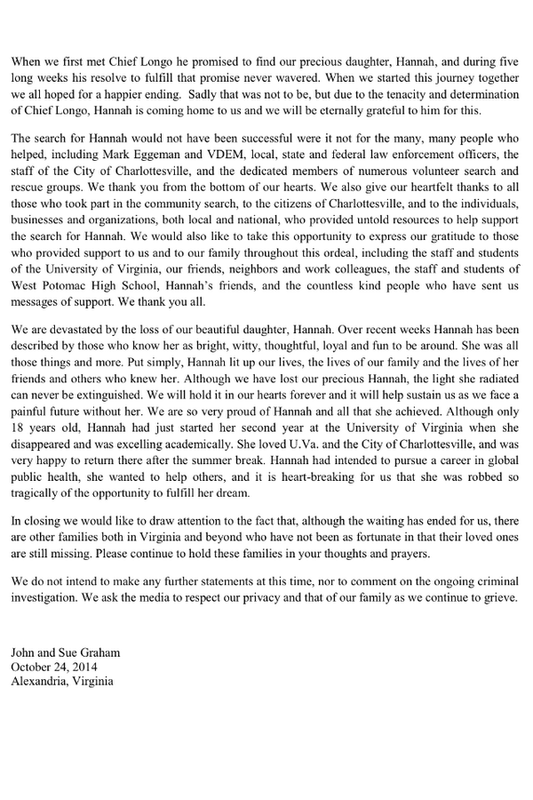 Statement from #HannahGraham's parents after remains found in AlbCo are positively ID'ed as the missing UVA student.